Thanks to the encouragement of her instructor and family, Kelsey Wog began swimming competitively at seven years old. Born in Regina, Saskatchewan, and raised in Winnipeg, Manitoba, she is currently competing swimming at the national and international level. Kelsey has competed in the Canada and Western Canada Games, as well as the Youth Olympic Games in 2014. 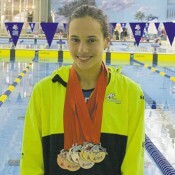 By 17, Kelsey had already broken three Canadian records in the 15-17 age group in swimming. In 2015, Kelsey won two gold medals in the 100m and 200m breaststroke events at the Canadian Swimming Championships, as well as a silver in the 50m breaststroke swimming. Kelsey has already made a name for herself as an elite level swimmer. Kelsey competed at the 2016 Olympic and Para-swimming Trials, winning bronze in the 200m breast, but failing to qualify for the Olympic Games in August. At the Junior Pan Pacific Championships in Hawaii later in 2016, she won two individual medals as well as silver with her 4x100m medley relay team. Kelsey chose to stay home for university after graduating from Vincent Massey, and has already been hugely successful at a CIS level. At the 2016 Canada West Swimming Championships, Kelsey brought home three gold medals and one silver, and was awarded “Rookie of the meet” for the University of Manitoba Bisons swimming. In December 2016, Kelsey competed for Canada at the FINA World Swimming Championships, her first competition at a senior international level. There, she won a silver medal in the 200m breaststroke swimming, and finished fourth in the 4x50m medley relay alongside Canadian teammates Penny Oleksiak, Michelle Williams, and Kylie Masse. When Kelsey’s not busy training, she practices Highland dancing. On her bucket list: Travel to Africa and desert camp with the animals. SWIMMING CANADA (Dec 11) Canada finished off its best-ever performance at the FINA World Swimming Championships (25m) Sunday with three medals, including a gold. THE MANITOBAN (Dec 1) The Bisons had eight swimmers from both the men’s and women’s swim teams, but it was Alex Shogolev and Kelsey Wog who stole the spotlight this weekend. MYTOBA (Nov 29) At the 2016-17 Canada West Swimming Championship at the University of Alberta in Edmonton from November 25-27, the Manitoba Bisons swim teams had strong performances but the strongest was the amazing debut of Bison rookie women’s swimmer Kelsey Wog.